Vintage military watches are probably one of the most sought after pieces of watchmaking today. Everything about them was designed from the ground up to be ready for harsh conditions and less than ideal treatment. Take the Benrus Pilot's Watch from 10:25 Vintage I showcased last year for example; the highly legible twenty four hour dial, the fixed spring bars, the hacking movement all scream purpose drive design. Yet go back fifty years from the quagmire of Vietnam to the literal quagmire of European trenches in World War I and you have a very different story when it comes to military watches. Photograph of a 1918 'doughboy'. The wristwatch or "wristlet" as it was known was still considered an accessory for ladies with men of proper etiquette still using the faithful pocket watch. There were a few Swiss companies that made wristwatches for men however there weren't really gaining much traction. However once these men were in the trenches they quickly found that advancing towards enemy lines rifle in hand, bullets whizzing overhead, whilst fumbling with a cumbersome pocket watch wasn't going to work. Necessity is the mother of invention so soldiers took to soldering wire lugs onto the top and bottom positions of their pocket watches and a few pieces of leather and a stitch or two later you now have a Trench watch. A single-piece leather strap threaded through these lugs over a cuff/bund allowed the watch to be worn on the wrist and time to be checked at a glance. Whilst the war had been ravaging the European countryside since 1914 it was only in 1917 that American troops joined the front lines. For several years America had provided her allies with munitions and supplies but the sinking of passenger liner Lusitania and the deaths of 128 Americans on-board had raised tensions. Since the Mexican-American war, the troops of the American Expeditionary Force had gained the nickname "Doughboys" though the exact reason as to why is still debated by historians. When the AEF joined the fight in Europe the allied soldiers took to using the name as a term of endearment for all US troops. It is this nickname that Tom, Co-Owner of Doughboy Watch Company, chose in memory of those men whose watches he now lovingly restores back to original condition. I spoke with Tom about his work and the incredible stories his watches have. TC: If you could briefly introduce yourself, how did you first get into watches and the more specialist field of Trench watches? DWC: My name is Tom, I’m the co-owner and designer for the Doughboy Watch Company located in Philadelphia Pennsylvania. Before starting Doughboy, I was a commercial Photographer for 10 years. I’ve always been a person of process, and working with my hands. In 2012, I picked up my first watch off of a table at a local flea market near Philadelphia. I was fascinated with the watch when I first saw it, and since it was not working I wanted to see if I would be able to repair it. This began my interest in watches and watchmaking. I started reading as much as I could about watches, and that's when I came across my first image of a trench watch. Since I have always had a great interest in military history, the trench watch became something that I immersed myself in reading about. It’s incredible to think that the reason why all of us wear watches on our wrist today came from the brave souls who wore them out of necessity in combat. TC: All of these watches have seen so much and have a unique story. What makes taking in a personal watch different? DWC: Working on customers personal pieces is a delicate subject. The watches that we pick up for our inventory have been cast aside for us to rebuild. When you're dealing with a personal watch, you have to remember that the watch is a family heirloom and has a great deal of sentimental value that not, and we take a great deal of time talking with the customer before hand to ensure that the watch is in operating condition before we even consider taking the project on. You want to replace as little as possible on the watch to ensure that it is as original as possible, no exceptions. I once had to find a part for a personal watch that took several months. It's a very time consuming process that requires a lot of attention. If we feel that the watch is in good shape, and the owner has permission from the family to convert the watch we will gladly do so. This way it can be appreciated again. TC: One of the pieces that caught my eye was an 1917 Elgin Trench watch that you were looking into the owner's draft papers and service history. Through researching and restoring these soldiers watches do you feel a connection with them? 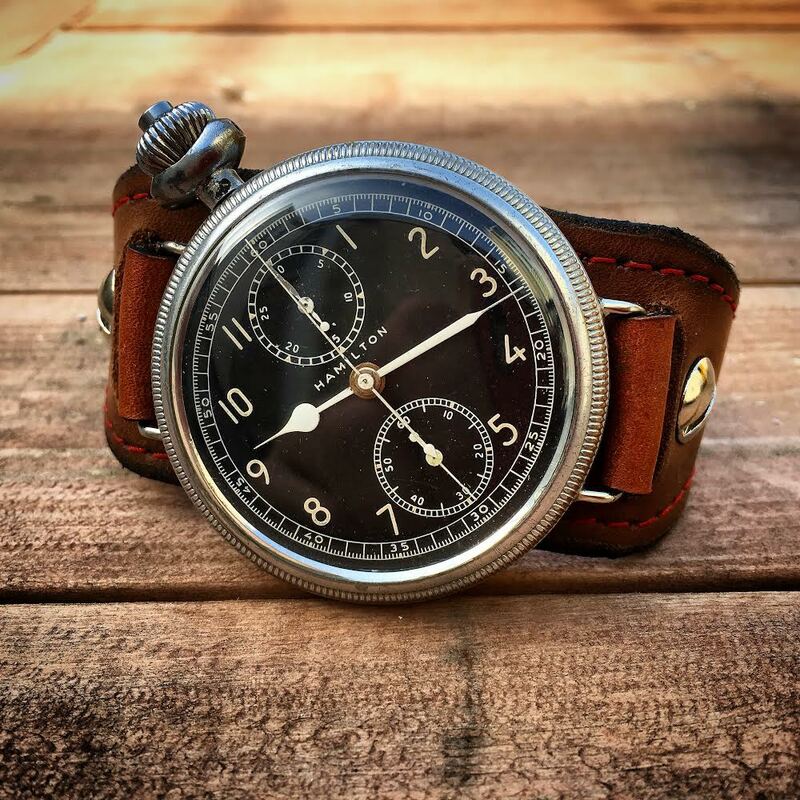 DWC: You have to remember that the watches that we see at antique stores and flea markets had a life before we pick them up and own them, and I find great joy in bringing these watches back to life so that they can have a second life and be appreciated again. As stated before, it's unimaginable to think of what these people went through in that conflict. Our namesake and what we do is a tribute to the ingenuity that they had to create something that we all can appreciate today. As for the 1917 Elgin it has an incredible story behind it. When I came across it, it was in need of serious repair and the owner thought that it just needed a new battery! A few weeks later, it was up and running again, and with a little bit of research we were able to trace the actual address of where this watch resided in New Orleans Louisiana. Hopefully soon I will hear back from the national archives regarding where this watch traveled and saw combat in Europe. DWC: I think the most chilling part of the entire process is when you are able to watch a machine that was built over a century ago run for the first time in who knows how long. You’re taking something that has been practically thrown away and making it a thing of beauty and appreciation again. It shows a sign of the times that not just our company, but lots of people are realizing that things were built incredibly well in America a century ago and that they need to be restored so that they can be appreciated again. I also really enjoy finding the engravings inside of the cases. You find a lot of engravings that were gifts from a wife to a husband, or parents to a son, or just the name of the original owner. It's truly amazing. TC: I think it's quite sad that there is a real lack of appreciation and understanding for these kind of watches, especially when it comes to American watches. With so much rhetoric thrown around today about how "America doesn't build anything anymore" everyone is forgetting about what was made. Everything that was built before the age of "planned obsolescence" is going to keep on working if given care and attention long after you've thrown out that iPhone 6/7/8 etc. Do you think about the irony that a lot of these trench watches are truly beautiful with amazing engravings and dial designs that ended up being worn in one of the worst periods in human history? DWC: The world was going through a rapid change in mechanization at this point due to the industrial revolution of the past decades. Even though humanity experienced the horrors of what this did to combat, it did give light to a few technological advances that did benefit all of mankind, including the simple wristwatch. TC: It is unfortunate that humanity's ingenuity is on full capacity when we're using these inventions to dominate. Though without World War 2 we wouldn't have radar or computers and without the Cold War there wouldn't have been as much money and emphasis on the space race and NASA. What is your favorite piece that you restored? DWC: The most memorable watches that have come through our shop are the Non Luminous Mark Five cockpit watches. These watches were mounted in the cockpits of world war one fighter planes and were carried with the pilots on an everyday basis. We’ve only had two or three of them, but each and every one of them are very special. You're taking something that lived with a person who was about 19 years old, had about 11 hours of flight experience, and was expected to live for only 11 days in combat. Its truly amazing to think about this when your bringing one of these watches back to life. Other watches that I look back to as a favorite is a watch I picked up that was for the 1893 Chicago Worlds Fair. It was in pretty bad shape mechanically when I first found it, but the case and dial were in immaculate condition. This wonderful piece is now in our personal collection and comes out on special occasions. TC: Do you wish that in modern watches you would see the variety of case shapes/designs engravings as you find on trench watches? DWC: We have been working for the past two years on making this a reality. The ultimate goal I think for anyone in the states is to fabricate a watch that is 100% made on American soil. Since a production watch has not been made in the US in over 50 years, it's a very daunting and expensive challenge but stay tuned for what we have in store. TC: Sounds exciting! I think now more than ever people (at least #watchfam) are ready for a true American manufacturer again. Finally, What watch are you wearing right now? DWC: I'm currently wearing a 1942 Hamilton Model 23 chronograph that I picked up the other weekend on a trip to Lancaster Pennsylvania. I had to drive about 80 miles each way to hunt down which was well worth it. These watches were used as navigational instruments by the US army in the second world war. This watch is an incredible timekeeper, and since I found it about 800 feet from the gates of the old Hamilton watch factory, it's got a great story behind it as well. I'd like to thank Tom for taking the time to answer my questions. To see the full collection Trench watches, head over to www.doughboywatchco.com. You can also see some behind the scenes shots by following Tom on Instagram. A few days ago I spoke with Christian Zeron from Theo & Harris about social media, the plight of ADs and homage watches. Later this week I'll be publishing my review of the Niall GMT Black Swan but in the meantime, I wanted to learn a little bit more about the man behind the brand. What drives someone to revive the long forgotten art of American watchmaking? I spoke with Michael Wilson, founder of Niall, to find out. Anna Rose-Kirk is an English clockmaker from Birmingham. In 2016 she was listed in the WatchPro Top 100 Trailblazers and won the F.P. Journe Young Talent Competition.